We’re lucky to work from home. What do you do you with your puppy when you work full time. 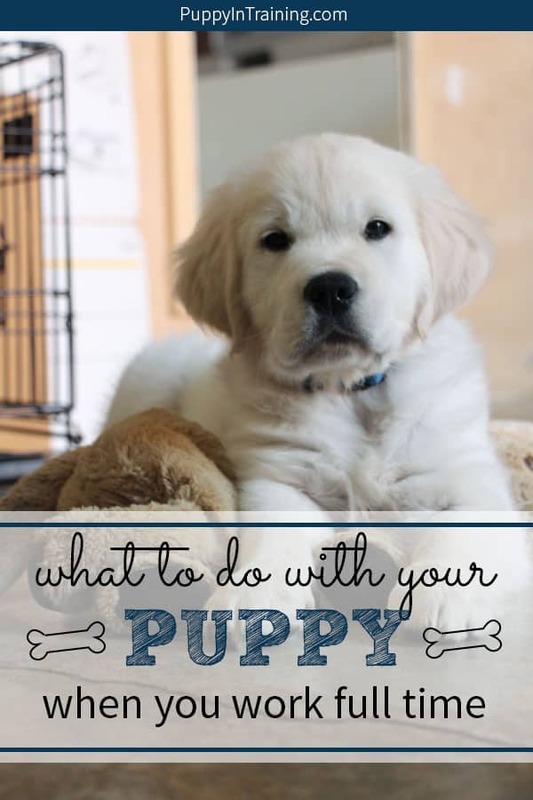 Some of our most popular blog posts are about how to potty training your puppy and how to crate train your puppy so it’s no wonder we receive a plethora (my wife Allison’s favorite word) of questions on these two subjects. Sure Colby, but what do those two subjects have to do with today’s question: What do you do with your puppy when you work full time? Okay, let me give you a quick answer to the above question: You should never leave your puppy in the crate all day! When we first bring home our 8 week old puppies we do not crate them for more than 1-2 hours during the day. Back then I had no intentions of getting a puppy. Maybe a goldfish, but a puppy!? I had no time and a puppy was definitely out of the question! 7+ years after joining the Rat Race I called it quits and went back to school. During this time I attended classes, but I also spent a large portion of my days studying, reading, and writing at home. …Enter our rescue pup, Linus! Okay, so I chose not to raise a puppy while working full time so what’s a person to do if they are at work all day? Working full time with a puppy? What to do? I think it’s difficult, but not impossible to get a puppy while working full time. You can see my answer in the section above. That does not mean you can’t do it. Family Members – My parents, brother, sister, parent-in-laws have all helped as puppy sitters. Friends – Michael, Kristen, Jason, and Nicola have all been life lines for me and my puppies. Pet Sitters – When we got married a couple months ago we employed our first paid puppy sitter. Doggy Daycare – We haven’t tried doggy daycare, but we see many dogs enjoying their day at Wags and Wiggles doggy daycare. I’d recommend bringing on one or more of the above people to help you, but your puppy should also get used to spending sometime alone during the day. I’d make it a goal to try and not crate your puppy more than 1-2 hours twice a day. QUICK RECOMMENDATION: We highly recommend crate training (but don’t overuse your crate) and if you’re wondering we recommend and use the MidWest Life Stages Double Door Crate w/ Divider with all of our puppies. Even if you do not work full time I highly recommend getting others to help you when raising a puppy. By the way, you won’t need help from friends and family forever. Although I’m sure your puppy will always enjoy the company of people over being left alone most people cannot spend time with their pup’s 24×7. Our dog Linus adjusted to being left alone for longer periods of time somewhere around 6-9 months of age. At that age he was potty trained and we no longer crated him during the day. We actually put a little webcam on him and as you might have guessed he spent 95% (and 85% of statistics are wrong) of his time sleeping on the couch. QUICK TIP: Guess what? There are several fancy pants new dog cameras on the market now. If you’re interested in monitoring your dog’s activities while your away then you might want to check out the Petcube. Become A Guide Dog Puppy Raiser! I found a loophole (at least for me) to raising a puppy while working a full time job. About 2 years after raising and training Linus I became interested in getting another puppy. I was working full time again and I wasn’t quite ready for the challenge of raising a puppy while working a full time job. In April 2006 I started researching different guide dog organizations from Guide Dogs of America to Canine Companions for Independence. My goal was to serve my community, raise, and train a puppy while working my full time job. My Solution: Guide Dog Puppy Raising! Raising a guide dog puppy came with the benefit of access (for the puppy) to public places including my work office (that was the big one), restaurants, grocery stores, movie theaters, etc. basically most places the general public is allowed. I got my first guide dog puppy and with approval from my manager and the CEO of the company I worked for I was able to take Stetson to work with me every day. Do not crate your puppy all day while you are at work! A crate is a great tool for managing your puppy however overuse can lead to behavior problems not the least of which could be pee/poop accidents in the crate. A puppy is not easy work. You need a considerable amount of time, dedication, patience, persistence, and a few other adjectives to make sure your puppy becomes a well balanced dog. If you work a full time job and you are at the office all day make sure you think things through and employ the help of friends and family before bringing home a puppy. Without a proper support group your puppy may end up with behavior problems that will drive you nuts. Does raising a puppy sound like too much work now? After reading my post do you think you don’t have the time, support network, or patience to raise a puppy? If so, then a better solution for you might be to adopt an older dog. Take a look at the full blog post: Yes, it’s OK to adopt a dog if you work full time. Do you guys have a puppy and work an 8 hour day? Tell us about your situation in the comment section below. Petcube Bites – Treat dispensing dog cam. PetChatz – Video chat with your dog and dispense treats. These dog cams can be expensive, but often worth it for peace of mind. I just got a five month old Pomeranian puppy about a week ago. He’s okay in his crate as long as I stay in the same room with him. For some reason, even with a sheet over the crate, one of my sweaters over the crate with my scent, a frozen Kong stuffed with kibble and peanut butter to chew on, and the TV or music on, he freaks out if I leave the room. I can’t take a shower, let alone leave the apartment, without him melting down and barking and whining for a long time. It’s driving me and my neighbours nuts, and I’m afraid if he doesn’t get under control my neighbours will get fed up and demand that I get rid of him. I’m going to have a dog walker come at mid-day when I go back to work next week, and I’m worried that (assuming he eventually settles down after I leave) when she leaves he’ll just start going nuts again. Any tips or suggestions would be very, very welcome. Hi, me and my family are thinking about getting a puppy this year but nobody will be at home during the day. We were wondering if you can take young puppies to doggy daycare and how long can puppies be left in the crate? Crate training is not necessary. It can also be cruel! Crate training is the best thing you can do for your dog. I have heard horror stories of what dogs get into in an empty house. It can be so dangerous for the dog. It also makes it so much less stressful on the dog if you take him somewhere. He always has his safe place. My dog loves his crate. Goes into it even when are not home. I disagree. I got my puppy at 8 weeks. He went in the crate at night from day 1. I made the crate smaller while he was small. He never messed in his crate. I was working full time. I left him in the crate for about 5 hours and then came home for lunch for 30 min and left him for another 4 hours. He is now 7 and a perfect dog. Never messes anywhere. Never chews on anything that isn’t his to chew on. We stopped locking the crate after 2 years and he still uses it on his own whenever he wants to relax. Be more stubborn than the dog for the first 2 years. It’s a lot of work but it more than pays off. I’m looking at getting a Weimaraner puppy and due to them not being able to be left alone much I have arranged being able to take him/her to work with me. Just looking for some advice on how to puppy train whilst at work? When I take my puppy to work I setup a small play area with a bed, toy, and tie down. Every puppy is different, but most of my puppies would sleep most of the day. My schedule usually looked something like this: 2 hours of work, 15 minutes of walking/relieving my puppy, back at my desk and give the puppy something to chew on/play with and usually they’d fall back to sleep after about another 15 minutes of play at my desk. I hope that helps. Good luck with your new puppy! My husband and I just rescued a puppy a little over a week ago, according to your blog we’ve already made a number of mistakes. She is a 13 week old (11/11/17) and we believe she is a dachshund terrier mix. We let her sleep with us in bed. This was working out okay but I think its creating dependency issues. We will start to crate her at night today and move her crate to the bedroom (it is in the living room right now). We both work full time, but I’ve somehow managed to make it home during my lunch break to feed, walk, and play a little (about 30 mins total). We do crate her during the hours we are not home. What is the longest period of time that it is okay to leave her in her crate? We also just bought a video camera to monitor her while we are not home. She cries so much that sometimes she has so much anxiety she spits up her food. We feel awful and would love some of your advise. I have a 4 month old puppy and I work three days a week. I did have a neighbour puppy sit for me, but they exercise her too much to try to wear her out so they can handle her, so until she’s a bit older I’ve started leaving her home alone. She has my large bathroom to herself, with a crate and potty box. I leave her with about a millon (ok 12) stuffed kongs and other puzzle toys and 2 water dishes. When I’m home we spend a lot of time together in the bathroom playing, training and doing her puzzle toys together so she doesn’t just associate it with being alone. It also gives us a chance to get rewards for using her puppy potty. I also practice leaving her by herself for nap time while I’m home so she can still hear me. On days when I leave her alone I get up at least an hour earlier so I can take her for a short walk and play with her and do some training so she’s a bit worn out by the time I leave for work. When I get home I go into the bathroom and have her settle before getting attention and then play with her there before letting her out. It takes a lot of work to leave her alone, both in training and preparing toys to keep her busy during the day, but it is possible. She does much better on her own than my last dog. He was 4 years old when I got him, and at the time it never occurred to me that I needed to teach him how to be alone. He ended up with separation anxiety, but luckily one of my neighbours was usually home so he didn’t often have to be alone.